When the ratio is close to the value of 50%, we should not trade. Ratios tool shows the historical buy/sell ratio from different brokers. You can see that this tool has two panels. The top panel is a candlestick chart, and the bottom panel is a ratio chart. You can customize a layout of this tool. For example, you can disable some brokers or select different timeframes. We analyze ratio from different brokers to diversify risks. We should look for the majority of brokers showing unidirectional signals. 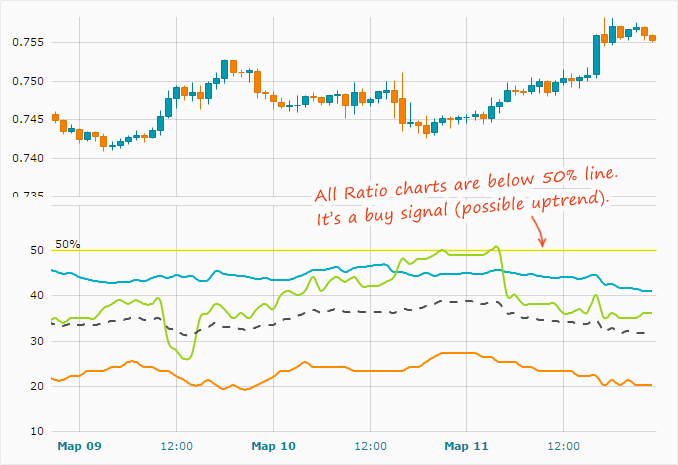 Buy the way, every ratio line shown on the chart represents a percentage of buyers, while a percentage of sellers can be calculated by the following formula: 100% – percentage of buyers = percentage of sellers. The dotted black line is an average ratio. You can use it as a usual ratio, but with a shortened signal width (sell, when the average ratio is more than 53%, and buy, when the average ratio is less than 47%). 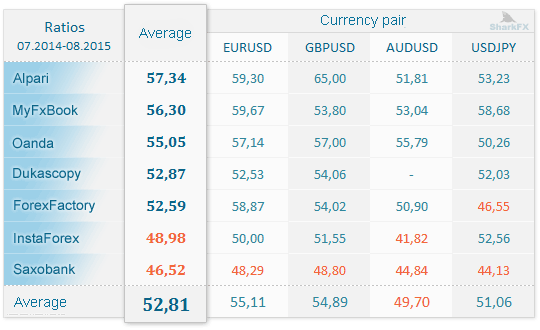 The table above shows efficiency of the ratio signals from different brokers and currency pairs. Employ this information to give a preference, when not all of the brokers give unidirectional signals. Please consider that using only the ratio signal to enter the market produces no more than 53-57% of profitable trades (in case a stop loss is equal to a take profit).